Phones and tablets have become invaluable in today’s world. Phones have evolved from simply being devices for answering phone calls to being used for everything today. One of the major activities that most users do on their phones is using it for entertainment. Most users like to play games on their handheld devices when they want to pass time. 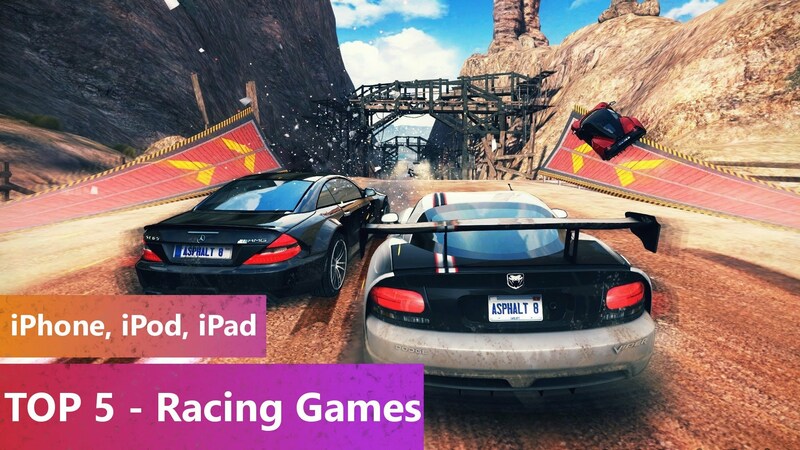 Here are a list of the best racing games for iPhone and iPad. Have a fun time driving with Real Racing 3! Drive your car through various game modes (time trial, standard race, Time Shift Multiplayer) across some magnificently rendered racing tracks from the real world. The game is free to play! With real racing features and a realistic driving simulator, GT Racing 2 is dubbed the real car experience. You have over 71 licensed cars and 13 tracks to have fun with. There are different game modes like duel, knockout and overtakes. There are also the standard racing modes. Fantastic graphics and vehicle dynamics make this game a hoot! Fly your cars across various ramps and around stumbling blocks and get airborne with Asphalt 8! With stunning aerial stunts, amazing graphics and action paced, nitro-fueled races, this is the game you would want to play. Features some of the best cars, over 180 events across 8 seasons and several game modes! Go on a futuristic space journey with AG drive! Challenge gravity in an elegant arcade racing game with amazing graphics and fun-tastic races. There are various game modes: time trials, elimination races on offer. Fly into outer space and explore the galaxy while racing! The game offers some action-packed races to take part in. Ride the waves on Riptide GP 2! There is a career mode and online multiplayer mode with upto to 4 players. There are 9 powerful water crafts for you to race with. Customization is also featured, so trick them out as you want! Stunting, sprint races, hot laps and elimination are some of the featured modes. BONUS! Check out this game to complete your racing experience! Red Bull gives you wings. Literally. Soar high in the sky and fly some of the world’s most maneuverable aerobatic planes. Become a master of the skies and challenge other pilots. Fly over real world locations and perform death defying stunts doing so. This is the game you should get if you are a fan of aircrafts! So, that is our pick for the best racing games for iPhone and iPad. Which one would you like to play? Do you have any particular favorites? Let us know in the comments below!